A few weeks ago I published a short treatise on the golf swing. The more I practice and play with the swing I described, the more I am convinced the principles described are the right ones, of many, for the purpose of hitting a straight ball. In that document I said I assumed that your pre-swing fundamentals were sound. That is not a safe assumption, even for golfers who know what those fundamentals are. 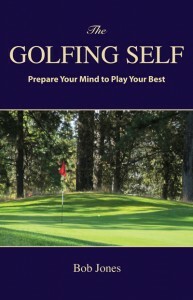 Golf is practical examination, not a written one. Golf is about how to do, not how to say. There are two pre-swing fundamentals I have been emphasizing lately to great effect. Let me share them with you. One is to hold the club lightly at address. Hold the club with the same pressure as you would apply when shaking the hand of a young child. Keep that same pressure as you take the club away. This keeps your body relaxed so clubhead speed can build up freely. The second one is more of a mental aspect of the setup than a physical one. I get into a posture in which I feel relaxed and neutral, that is, not posed, or poised, in any way. Nothing is out of balance. I’m not reaching for the ball. I’m in a relaxed yet athletic posture that can move without a hitch into the flow of the golf swing. You will notice that both of theses points have to do with relaxation. The more relaxed you are at the start of the swing, and can maintain that relaxation throughout the swing, the better you will hit the ball. Promise. Many golfers shoot about four or five strokes above their usual score when the play a golf course for the first time. If you pay attention to a few details, that doesn’t have to happen. – how fast are the greens? Are they faster than the practice green? – are there elevated tees on any par 3s? If so, how much more club should you use? – for big hitters: are there any par 5s that you should not try to reach in two? – are there any greens that have big trouble if you shoot over them? – are there any greens that are sloped so much that you do not ever want to be above the hole? – are there any water hazards that cross the fairway and can be reached from the tee? This is a lot to ask, but if you ask succinctly and listen to the answer instead of getting into a conversation, the staff won’t mind helping you. Get a scorecard and read the local rules. Ask about anything that isn’t clear to you. In general, tee off to the center of the fairway. Aiming for the 150-yard pole, if there is one, is seldom a bad idea. When hitting into the green, aim for the center. Aim for the pin only if the approach is wide open and there is little or no trouble if you miss the green on that side. Chipping can be different from course to course. There can be light rough around the green, heavy rough, or no rough. The only way to solve these problems is to be prepared for them. Learn how to chip out of varying thicknesses of rough. Learn how to use your putter from off the green. Learn how to chip up to a raised green when your ball is on an upslope to the putting surface. Play from the right set of tees! If you can’t reach half the par 4s with a 6-iron or less, those tees are to long for you. If you know you will play this course again, make a note of what clubs you used on each tee and a note of the one you would use, if different, when you play the course again. When you get to your tee ball, go over the spot you now see to be the best landing area for an approach to the green. Look back the tee, then turn right around and find an aiming marker for this area. Make any other notes about where to hit, or where not to hit, the ball on any particular hole. Play conservative golf. Play our own game and see what happens. It will likely be good enough. Most of putting is mental. A good stroke is vital, but technique alone is not enough. It’s the little things that make the difference, and those little things are in your mind. These are notes I have made to myself in the past month around the practice green. 1. Downhill putts can be scary because we fear the hill taking the ball away from the hole if we miss. While that can happen, think of the slope differently. Think of how it will help you feed the ball into the hole. When you line up your putt, think of how you can make the slope your partner in sinking the putt. 1. I do not like my putts to die slowly at the hole. For every one that lipped from the side, two have gotten knocked off their line in the last few inches. I like to hit a putt that rolls in positively into the hole instead of apologizing its way in. 1. When you take a last look you take before you start your putter back, firmly feel the ball going in. This connects your putter with the hole. Then stay out of the way and let this feeling of connection guide your body to making it happen. 1. Make every putt under twenty feet threaten the hole. Never up, never in. 1. Your entire putting process must be based on how to make the ball go in, rather than how to avoid missing. We do the latter more often than we think we do. 1. Don’t let slope intimidate you on short putts. Up to about two feet, forget the slope and knock the ball straight in. From three or four feet, look at the part of the hole where you know the ball will be entering. Give the ball to the green and let the slope do the work for you. 1. However, unless the green slopes severely, there really isn’t any break in an uphill putt of four feet or less. Just ram it in there. 1. Leaving longer uphill putts short? That’s because the slope is pushing the putt back toward you. Just think of pushing back at the hill and the ball will get there. 1. You might think you have to hit long putts (>40 feet) hard. If that makes you add a little extra with your right hand, that will throw off your stroke. Instead, think that the ball is transparent to your putt and that you will first contact the ball on the inside of its leading edge. You will hit the ball smoothly and with much better distance control. 1. If you know the putt is going in, it will. If you think you’re going to miss, you will. The hardest thing to do in any sport is to start accurately from a dead stop. What normally happens it that initiating motion starts with a jerk. It might be a slight jerk, one you don’t even notice if you aren’t paying attention, but it’s there. In golf, that little jerk is enough to throw your golf club off track and put tension into your body in order to keep the club from getting even farther off track. Forget about getting it back on. This is true for any stroke. The effect is equally damaging in every stroke. With a driver, it will cause you miss the fairway. With an iron, either from the fairway or around the green, it will cause you to mishit the ball in any number of ways. With the putter? You can fill in the blanks. It is my opinion that many good swings from good setups that result in poor shots were doomed in the first inch the club got taken away from the ball. The way to solve this problem is to use your mind correctly. A fact of life is that mind leads body. Whatever you do with your body, it occurs in the mind first. Then the body follows and expresses in the physical world what already happened in the mental world. What I want you to do, then, before you take the cub away, is to imagine that the club is going back. Take the club away first in your mind, then do it again with your body. There should be no more than a quarter-second delay between the start of your visualization and the start of the club. Since your mind is already moving, it is easy to have your body follow smoothly. Trust me, this works. Try it with any club, any shot. Start the club back with your hands, arms, body, whatever you use, and monitor the physical feeling you have at the moment of takeaway. Then set up again and imagine the club moving back while you stay still, then let the club follow that mental image. I think you will find your takeaway to be much smoother. If you continue your stroke into a full swing, you will also find it to be more relaxed and controlled all the way through. Now your good setup and good swing will lead to a good shot. 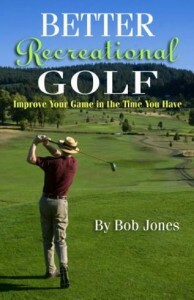 When I wrote Better Recreational Golf five years ago, there was a chapter missing. There’s nothing in there about how to swing the golf club. That was a deliberate omission, for the simple reason that I didn’t know what to say. I could do it, but I couldn’t say it. Now I can. The above-titled publication, my latest, fills that gap and is now available to you. It is the result of years of trial and error, a few lessons, some hard thinking and logical analysis, and trust. By following these six fundamentals I now hit the ball as straight as I ever did, but much more often, and I know why I’m hitting it straight. You can put these principles into your swing no matter what it looks like. They adapt themselves to anyone. 2. Swing with both hands. 3. Take the club straight back to control. 5. The hands lead the clubhead through impact. 6. Swing straight through the ball toward the target. Six Fundamentals is a 3,600-word page on this blog site, accompanied by eight short videos and one audio file. Here is how you get your copy. 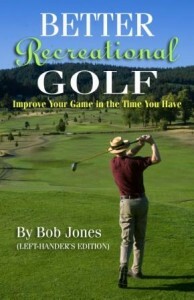 Go to my website, www.therecreationalgolfer.com, and sign up on the green form for my monthly newsletter. When you do, you will be sent an e-mail message with the link and password to this password-protected page. That’s all you have to do. It’s FREE. Just sign up and Six Fundamentals is yours. There is one small catch. The offer is good this week only, from October 6 through October 13. Sign up right away.